Cinco de Mayo has always been one of our favorite days at LinkedIn, and not just because we love any excuse to eat tacos and drink margaritas. It's because May 5th was the day we first launched LinkedIn back in 2003. Eight years is a long time, but in the technology world, it can seem like an eternity. Facebook, Flickr, YouTube, Twitter... none of them existed in May 2003. Neither did the iPhone or Android. Internet Explorer 6 ruled the web; Safari was in beta, Firefox was still Firebird, and Chrome was a few years away. And Justin Bieber was just another precocious Canadian nine-year-old. LinkedIn itself has changed dramatically since those early days. The LinkedIn network started with just ten people -- the founding employees connected to each other. Since then, it's grown into the world's largest professional network with more than 100 million professionals in over 200 countries and territories. LinkedIn currently has over 1000 employees in 12 offices around the world, including London, Paris, Sydney, and Mumbai. Perhaps most importantly, our kitchen now contains more than just Bagel Bites and Diet Coke. My own life today would probably be unrecognizable to my 2003 self. When we launched LinkedIn, I was single and dating a sweet, accordion-playing girl I'd met just a couple weeks earlier. Fast forward to today and we've been married for five years, with two fantastic children, ages three and nine months. All-night coding marathons have been replaced by repeated bedtime readings of "The Donut Chef." And that's to say nothing of the gray hairs I've picked up along the way. One thing has stayed constant through those eight years, however: I'm still working at LinkedIn. The average American changes jobs every four to five years; in Silicon Valley, it's often much faster. So why am I still here? For starters, it's fantastic to work at a company where everyone's voice counts. Have a feature idea? Recruit some teammates, build it on Hackday and it could be live on the site soon after. Wondering about our product priorities? Ask the executive staff at our bi-weekly company meetings. It's hard to preserve that spirit of openness and collaboration when a company doubles in size every year, but we've managed to do it with small teams and a transparency I've never encountered at any other company. 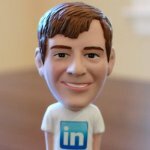 But what excites and drives me most of all is this: despite all we've accomplished over the past eight years, I believe LinkedIn's future holds even more promise than its past. With over 100 million users, we can provide more connections, more insights, and more professional opportunities than ever before. Professionals depend on staying on top of news in their industry; LinkedIn Today makes that process dramatically easier. Our users want to showcase their talents in a competitive job market; LinkedIn Skills helps you promote your skills, nurture them, and discover new skills you need to succeed. These and a host of other new and improved products show how LinkedIn can connect the world's professionals and make each one of them more productive and successful. At LinkedIn, we're in a unique position to completely change the way people work, and that's an opportunity that doesn't come along every day.